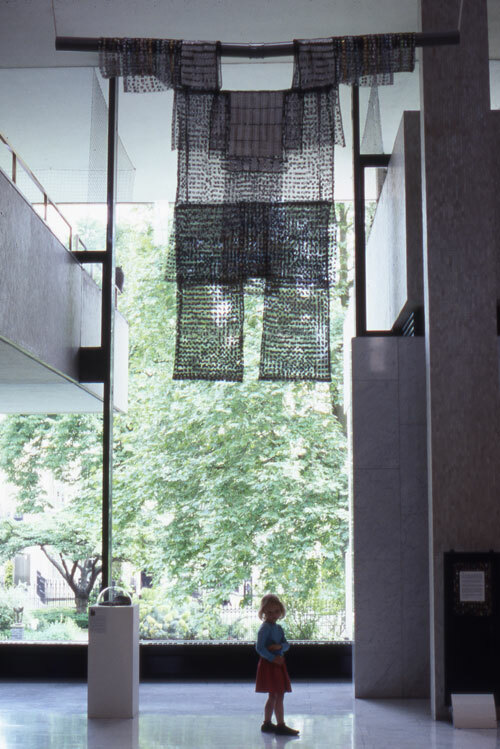 Made in 2000 for the Pharmacopoeia UK tour and subsequently shown in Scandinavia, Armour was recently purchased by the Royal College of General Practitioners where it is on permanent display in their headquarters on Euston Road. Armour was based on Liz Lee’s elderly patient Mr Brittain who suffered from emphysema, hypertension, heart failure, arthritis, indigestion and insomnia. Until the age of 50 he was relatively healthy but he did smoke. The smoking gradually destroyed the fabric of his lungs causing emphysema. It also contributed to the two heart attacks that together with his high blood pressure resulted in heart failure. He spent his last years sitting in his armchair breathing oxygen through a mask. Often in pain he could no-longer go out and had difficulty walking around his flat. From his medical record we calculated all the oral prescription drugs he took between the age of 72 and 77 and sourced related empty pill packs. The resulting foil packaging scultpure represents the tough outer shell many people have to adopt in order to endure the suffering caused by the chronic diseases so common in old age.